So I know this blog is all about our babe, but my co-worker showed me this awesome idea, which I think is very relevant because it saves time in the morning. Saving time is the morning is crucial to me, which is why I frequently go to work with wet hair in a bun now. The idea is called scrambled egg muffins. Getting a good protien rich breakfast is sometimes challenging for me. Cereal is easy. Instant oatmeal is easy. A Chobani is easy (which I do a lot of). A breakfast bar is easy. But I really love a warm real breakfast, like eggs! Problem solved with Scrambled Egg Muffins. Take out your KitchenAid’s (or a large bowl and a whisk), add some eggs (I did a dozen) and whatever you usually like to put in your scrambled eggs. Since we had ground turkey tacos last night, I added some leftover turkey taco meat, cheese, tomatoes and cilantro. I also added a little milk to make them more fluffy. I pour the mixture into a cupcake muffin tin and throw them in the oven on 350 for 25-30 minutes and voila! 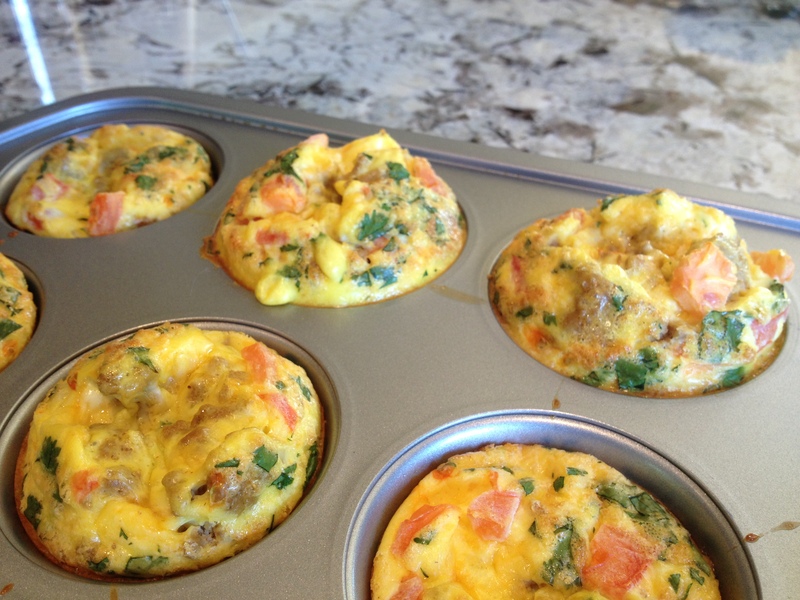 Scrambled Egg Muffins. Now when I want to get going in the morning I just grab an egg muffin and take it to work where I pop it in the microwave for a few seconds. Yummy! You can try any ingredients you like – salmon, broccoli, spinach, mushrooms, mama lil’s, anything! Have fun!